I’ve always been drawn to drawing squares and triangles on graph paper, and seeing the myriad ways that those two simple shapes could be broken down and recombined in fascinating ways. This coloring algorithm allows you to play with those ideas, to a level and precision not available with pencil and paper. Mathematically speaking, a dissection is when a shape is broken into smaller pieces, in such a way that there are no overlaps and no gaps. 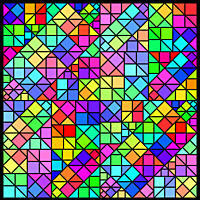 There are many ways in which squares can be dissected into smaller squares. A checkerboard is one example, where a larger square (the board) is dissected into 64 small squares (eight rows and eight columns). A few other examples of dissecting a square are shown in Figure 1. Triangles can easily be dissected into other triangles. Here, I’m interested only in isosceles right triangles, that is, triangles with a right angle and two sides the same length. A few ways to that are shown in Figure 2. Each shape can also be dissected into both shapes. For example, draw a square and one (or both) of its diagonals, and the square has been dissected into triangles. There are many different ways to dissect squares and triangles into squares and triangles, a few of which are shown in Figure 3. In each case, each shape is broken into small copies of both shapes. Then, each of those shapes can be further dissected, and so on, leading to a fractal tessellation. That’s what this formula does. There are four types of dissections that can be created, depending on with which shape you start and how you want to dissect it: triangle to triangle, triangle to both, square to square, and square to both. In any case, you need a starting point, which is the axiom. That can be either a triangle or a square. Then, you need one or two generators (two for either “to both” dissection type). A generator defines how the shapes are dissected into smaller shapes. It’s not necessary that the coordinates be integers, or that the shape have a corner at (0, 0), but I find that doing so makes it easier to keep track of the points. The reason you need to find the corner coordinates is so that the routine knows how to draw the smaller shapes, and so that the shapes retain their, well, shape. Another important consideration is the ordering of the generator points. The generator represents the axiom being dissected into a number of smaller shapes, called “sub-shapes.” The corner points of each of these sub-shapes need to be entered in a particular order (although the order of the sub-shapes for each generator is irrelevant). For example, the square is being dissected into four triangles. The triangle on the left of the square, with its hypotenuse along the square’s left side, could be sub-shape 1, 2, 3, or 4, it doesn’t matter. The ordering of its three corner points, though, is important. The scheme for triangles is to always have the right angle be at corner point 1, and then move counter-clockwise around the shape. This ordering holds for the axioms as well. This ensures that the angles are created properly, and that the sub-shapes don’t get turned inside out. So, for the triangle on the left, the correct ordering of its corner points is: first (1, 1), then (0, 2), and finally, (0, 0). Likewise, the top triangle’s corner points would be entered as: (1, 1), (2, 2), and (0, 2). In each case, the original square is broken down into one medium-sized square (2/3 of the size of the original), and five small squares (1/3 of the size of the original). The individual squares are symmetric, but the collection is not. The red squares indicate the location of the first corner of the axiom, and the black squares mark the first corner of the square sub-shapes. In the first case, each of the sub-squares is in the same orientation as the axiom, with the first corner in the lower left. In the second case, the sub-squares have been rotated, bring pairs of first corners together. The third and fourth cases have the same patterns of sub-squares, but now the axiom has been rotated so that the first corner is in the upper right. The effects of the layout changes are shown in Figure 6. Each panel is the fourth iteration of the corresponding generator shown in Figure 5. In each, you can see the characteristic cluster of a larger square surrounded on two sides by five smaller squares, but that’s where the similarity ends. Axiom parameters: Settings for the triangle and/or square axioms, depending on the “dissection type” choice. triangle -> both: An initial triangle is dissected into triangles and squares. Both triangle and square axiom and generator parameters are displayed. square -> square: An initial square is dissected only into squares. No triangle axiom or generator parameters are displayed. square -> both: An initial square is dissected into triangles and squares. Both triangle and square axiom and generator parameters are displayed. Square axiom: The coordinates of the four corner points of the square axiom, if used. Generator parameters: Settings for the triangle and/or square generators, depending on the “dissection type” choice. type: Triangle or square. If “triangle,” then the “corner 4” parameter is not displayed. Square generator: Parameters describing how each square is dissected, if needed. The counter-clockwise ordering of points is important for the coloring to work properly. Likewise, having corner 1 of a triangular shape be the corner with the right angle. This image reminds me somewhat of a stained glass window. It uses 3 layers, 2 for the glass and one for the lead came between the pieces. It begins with a square that is divided into 2 squares and 4 triangles. Each triangle is divided into a square and 3 triangles, as you can see in the upper left corner of the “Iteration 2” image. Outside: “Similar Paired Dissection” from lkm3.ucl, with the default settings. Check the “Repeat Gradient” box and set the Solid Color to black (0 red, 0 green, 0 blue). Layers: change the layer name to “Layer 1.” Merge mode normal, opacity 100%. Image: set both width and height to 480 pixels. Gradient: remove all the control points. Insert one at position 0, color red (255 red, 0 green, 0 blue). Insert one at position 100, 255 red, 65 green, 65 blue. Insert one at position 200, 255 red, 129 green, 129 blue. Insert one more at position 300, 255 red, 65 green, 65 blue. This layer is providing the saturation and luminance for the image, so if you look at the gradient in the HSL mode, you should see that the hue is constant, and the saturation and luminance ramp up to peaks at position 200, and ramp back down. Make sure that the “Smooth Curves” gradient mode is on. Your image might not look like much, but it should resemble the “Step 1” image in Figure 8. Your image should look like “Step 2” in Figure 8. Set “how much memory” to 584 and “speedup threshold” to 0.18. Set “# iterations” to 4. Click on the “Add...” icon to add a new layer, Layer 2. Replace Layer 2’s gradient with “rainbow 1” from lkm.ugr. Change its “Color Density” to 1 and clear the “Repeat Gradient” box. Set the “Solid Color” to white (255 red, 255 green, 255 blue). The Layer 3 gradient: delete all the control points. Add a black one at position 0, and a white one at position 399. When it’s all done, it should look just like the “Final Image” in Figure 7. If not, look back through your work and check the parameter entries. Or, just click on the finished image for the parameter set.